What Is The Infinity IT 8500? 6 Infinity IT 8500 Features You Should Know About! How Does It Compare To Other 2D S-Track Chairs? Final Recommendation: Should You Buy? User Flexibility (Height/Weight Range) Is On Point! One Of The Best Stretch Modes You'll Find On A Massage Chair! It's Ridiculously Overpriced For What It Can Do! 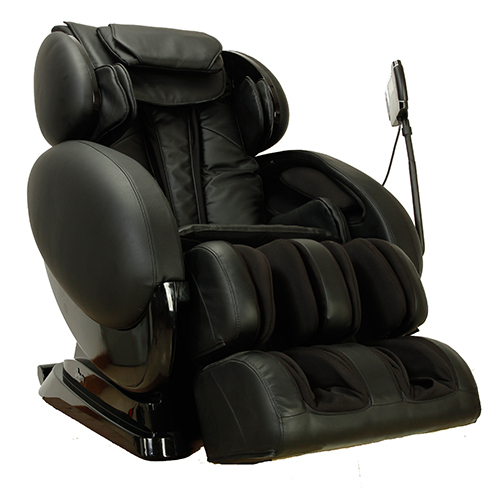 Infinity IT 8500 is a mid to high end massage chair capable of delivering a massage at deep tissue intensities. Infinity are an American company based out of Seabrook, New Hampshire. Inversion Therapy—A reclined seating position of 190 degrees. Fantastic User Flexibility—Infinity have really nailed down user flexibility in terms of height and weight. Their chairs work especially well for large and extra large body frames. S-Track & L-Track—The 2 categories that distinguish Infinity chairs. Now let’s examine the Infinity IT 8500 in greater detail! 30” is simply the roller track span or distance. It’s how far the rollers can track down from the neck. A 30” track span allows for rollers to track from the neck to the tailbone area of the lower back. On the contrary, a 50” track span allows for rollers to track from the neck all the way to the hamstrings. This is basically in a nutshell the difference between S-Track and L-Track. That is, L-Track chairs have a longer tracking range than their S-Track counterparts. My answer is always the same. L-Track Vs. S-Track is a preference thing. If you prefer having a roller style massage on the glutes and hamstrings, then go for an L-Track. However, if you’re okay with compression and vibrations for the lower body, pick an S-Track. Both S-Track and L-Track rollers contour to the spine’s natural “s” shape. Generally speaking, L-Track chairs are significantly more expensive than S-Track, so there’s a price aspect to this as well. Above we talked about the 30” S-Track part of this chair, so let’s divert focus and talk 2D rollers for a moment. What in the heck are 2D rollers and how do they work? 2D means 2 dimensions. 2D rollers move in 2 dimensions. They move from top to bottom and vice versa, and from left to right and vice versa. The image above explains this concept. Let’s start with zero gravity. What is zero gravity and how does it benefit me? In layman terms, zero gravity is simply a recline position first discovered by NASA. You see NASA were looking for the most optimum seating position for an astronaut. A position where stresses and strains are at a minimum, and a position where the body has optimum breathing and circulation. This is the zero gravity position. Zero gravity is a position where the legs are elevated with respect to the heart, and a position where the legs form an angle of 128 degrees with the torso. The stress on your spine is greatly reduced. Expanded lung capacity so breathing is easier. Increased circulation as the heart doesn’t need to work as much. 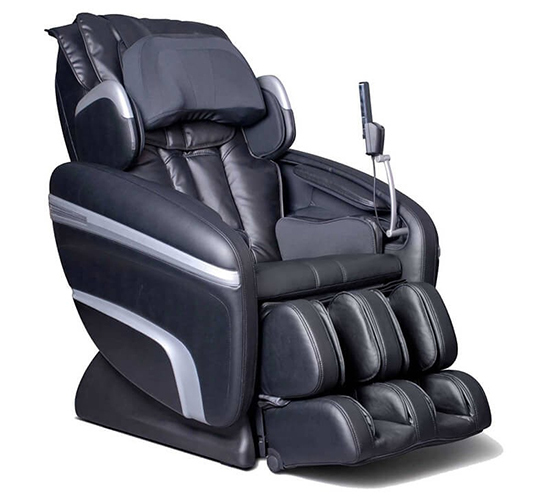 The Infinity IT 8500 massage chair has 2 stages of zero gravity, or 2 positions of zero gravity. The 2nd stage is a more reclined version of the first. Now then, what’s inversion therapy? Inversion therapy or inversion recline is a more reclined position than zero gravity. For the Infinity IT 8500 specifically, this is a recline seating position of 190 degrees. As you can imagine, you’re a little past being fully horizontal or flat. In this position your legs are slightly elevated relative to your head. Inversion therapy is especially useful when it comes to stretching. Rollers and airbags are best able to stretch the body when it’s in an inverted, 190 degree position. At this position, stretching is most effective. They require no preliminary setup i.e. no need to mess around changing manual settings. They are easily accessed by the push of a button on the remote control. The more auto modes a massage chair has, the higher it scores in my evaluation! Relax—If you’re not fond of strong intensity, this is probably a mode you’ll find yourself using. A good routine to do just before bedtime! Extend—As the name suggests, the goal of this routine is to stretch and extend the body. It makes use of the chair’s 190 degree inversion recline to stretch and massage the body using 4 different techniques. Refresh—Medium intensity and best done in the morning time after you wake up. Recover—Knock your socks off intensity! If deep tissue is your thing, then this is gonna be your go to mode. Makes use of both the rollers and airbags to provide a strong intensity massage. Unfortunately 4 auto programs is very few in my mind. If it were a chair that costs $1000-2000, 4 auto modes may be acceptable. But this chair is almost $4.5K! As far as i’m concerned, this is a definite con! Manual mode is important but nowhere near as important as auto mode. Why? Most of us simply don’t have the time to change settings and techniques. When you get on that chair, you want a massage and you want it now! Manual mode is great for people who have the time to experiment. Unfortunately, most people don’t. All that being said, it’s still important because at some point you will wanna explore the chair’s functionality outside the few auto modes. There will come a point in time where you’ll get bored of the same routine, and this is where manual mode comes in handy. 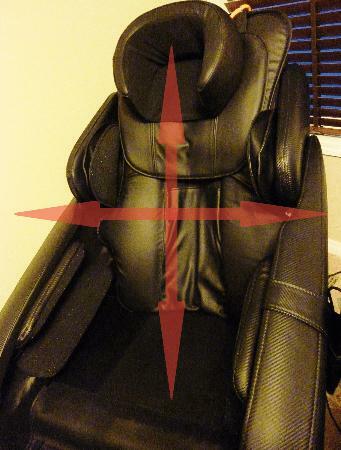 The Infinity IT 8500 massage chair has pretty decent manual control. You can pick from 6 different massage strokes (kneading, rolling, tapping, knocking, shiatsu, and combination) to target either the entire back, or a specific area of the back. Roller speed can also be changed from 6 different settings (slow to fast). This chair has a total of 38 airbags placed in specific areas where the rollers are unable to reach. These include the waist, shoulders, calves, arms, sides of the feet, inside the seat, and in the head and neck area. Airbag intensity can be adjusted from 5 different settings, ranging from mild to strong. The animation below illustrates how the shoulder airbags work. In this one you can kinda see what a waist massage would look like in action. And lastly, here’s one where you can see both the foot rollers and airbags. For each foot unit there are a total of 3 kneading rollers and 8 airbags that work to provide a kneading and compression style massage. There are also airbags located in the sides and back of the calf area. This is not a feature common to most chairs, so it’s worth mentioning. 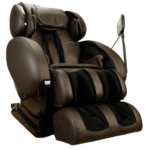 The Infinity IT 8500 massage chair has a seat that swivels. I know it’s hard to imagine what this looks like, but hopefully the animation below gives you some idea! What’s the big deal with a swiveling seat? Well it can be very useful when it comes to stretching the lower back. The upper body airbags firmly hold the shoulders in place, while the lower body airbags in the foot ottoman hold the feet in place. As the seat swivels from one side to another, so do your hips. This alternating “twist” motion helps stretch out the lower back, thereby alleviating pain and even improving posture! User Flexibility Is Definitely On Point! Don’t know if you noticed but user flexibility is a criterion I use for evaluating a chair. That being said, I don’t take it lightly. This chair has phenomenal user flexibility as it’s able to accommodate a wide user range in terms of both height and weight (see spec table above for recommended heights and weights). 3 kneading foot rollers is not something you will find in most massage chairs. It’s actually more common to find a dual (2) foot roller system. What’s also neat about this chair is how the foot airbags constantly inflate/deflate thereby forcing the feet to move against the kneading rollers. Unparalleled Inversion Recline Stretch Mode! If there’s one thing that defines Infinity chairs it’s their unrivaled extend mode. Both upper and lower body airbags firmly grip the head and feet in place while the chair reclines a full 190 degrees. As this happens rollers traverse the back to not only massage but also stretch the body. Infinity IT 8500 is special because it’s one of the few chairs that can do this! I’m all about pre-programmed automatic massage routines that can be enabled by the push of a button. 4 auto modes is a little too few in my opinion. Similar chairs such as Osaki’s 4000T has a total of 6 auto modes. That being said, this is definitely something Infinity should strive to work on for future updates/designs. Not Fond Of How Much It Costs! For a chair with S-Track rollers, the price on this chair is incredibly high. I get that it has some distinguishing features such as the inversion therapy and it’s unrivaled stretch mode, but $4.5K (approximate price at massage chair deals currently) for an S-Track chair just doesn’t make sense to me! Let’s compare the Infinity IT 8500 to 2 somewhat similar 2D S-Track chairs, the Osaki 7200H and the Osaki 4000T. 5’0 – 6’5 ft & 285 lbs. 5’2 - 6’2 ft & 265 lbs. 5’2 - 6’4 ft & 265 lbs. Price is likely gonna be the deciding factor when it comes to picking a massage chair. Everyone is looking for the best deals and the lowest prices! Below is based on current pricing at massage chair deals. Pricing is subject to change (and it will!). OS 4000T retails for $2,495. OS 7200H retails for $3,495. IT 8500 retails for $4,499. The loser here and by some is the Infinity IT 8500. It’s almost $1K more than the other 2 chairs! Both Osaki 4000T and 7200H cannot perform deep tissue massage intensities. Infinity IT 8500 can. Is this a big deal? You bet your bottom dollar it is! Unless you really don’t like deep tissue intensity of course, then it’s probably not so important. However, most people are all about deep tissue. Not only does it feel amazingly good, but there are also several benefits to a deep tissue massage! As far as massage intensity is concerned, the clear winner here by a mile is the Infinity IT 8500! 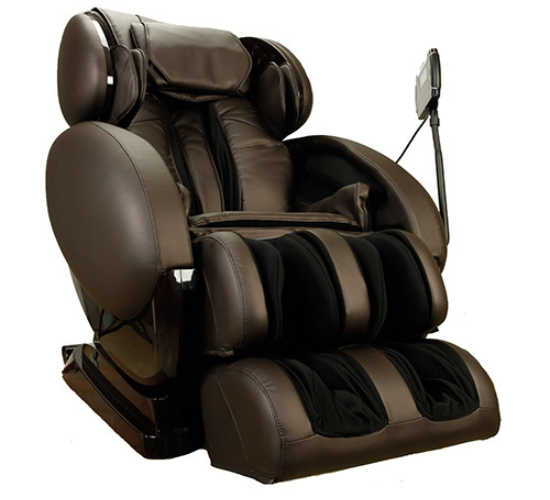 Auto programs are another important thing we all should consider before buying a massage chair. Obviously the more auto modes, the better! OS 4000T has 6 auto modes. OS 7200H has 6 auto modes. IT 8500 has 4 auto modes. Once again the IT 8500 is the loser with only 4 auto modes. In its defense it does have an absolutely incredible stretch mode, something both Osaki chairs can only dream of doing! But even still, 4 auto routines are just not enough. When I say user flexibility, I really mean suggested user height and weight. User flexibility is all about how well a chair is able to fit different body types. OS 4000T has a height range of 5’2-6’2 ft., and a maximum recommended weight of 265 lbs. OS 7200H has a height range of 5’2-6’4 ft., and a maximum recommended weight of 265 lbs. IT 8500 has a height range of 5’0-6’5 ft., and a maximum recommended weight of 285 lbs. Obviously the better chair is Infinity IT 8500 as far as user flexibility is concerned! Inversion therapy as mentioned earlier is a chair’s ability to recline to 190 degrees or more. Only one chair from the 3 is able to “invert” its user, guess which one? IT 8500 is correct! Inversion therapy by itself is useless. You see the beauty of inversion when it’s used to extend and stretch the body. A win for the Infinity IT 8500! Foot rollers are the key to an effective and relaxing foot massage. The more rows of kneading foot rollers, the better! Why? More foot roller rows means more foot coverage for massage. In fact with 3 roller rows you can reach as far the Achilles. This isn’t usually possible with dual rollers. OS 4000T has 2 roller rows. OS 7200H has no foot rollers. IT 8500 has 3 roller rows. 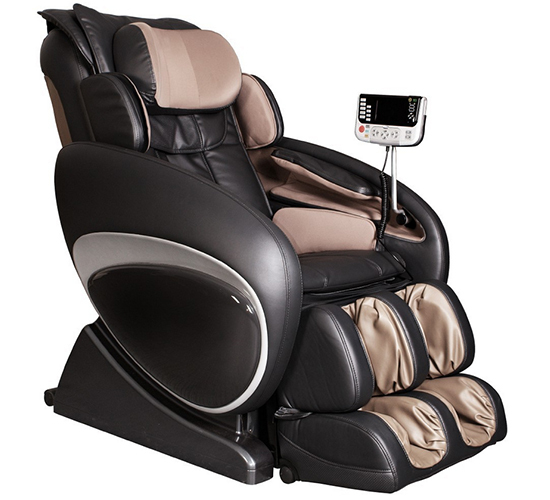 There’s no question in my mind that the one chair capable of delivering the best foot massage is the Infinity IT 8500. The other 2 chairs don’t stand a chance. Winner here is again the IT 8500! Do airbag numbers make a difference? If chair X had 20 more airbags than chair Y, does that make chair X better? It’s not about the number of airbags, but rather more about airbag design and coverage. It is possible for chair Y to have the exact same airbag coverage as chair X (which has 20 more airbags). It’s all about placement and design! Just wanted this to be clear before we look at airbag numbers. OS 4000T has 38 airbags in total. OS 7200H has 51 airbags in total. IT 8500 has 38 airbags in total. Even with the difference in airbag number, all 3 are great at compression massage! The last difference and probably the least important (at least in my eyes) has to do with integrated sound systems and LED lights. OS 4000T has no MP3 sound system or LED lights. OS 7200H has integrated MP3 speakers and LED lighting on the side panels. IT 8500 has integrated MP3 speakers. Music and lighting on a massage chair doesn’t mean much to me. They bear no significance to how effective a massage is. I do understand some people take these things more seriously than I do! Q1. How does one assemble the Infinity IT 8500? There’s a step by step assembly video that shows exactly how it’s done. The foot ottoman will need to be correctly assembled to the chair. For your convenience, below is the entire assembly video. Q2. What are the different colors available? For this particular chair you can pick from 3 different colors: black, dark brown, and taupe. I usually prefer the darker shades because they “appear” less dirtier than the others! Q3. What is the material of the chair’s upholstery? Synthetic leather just like 99% of all massage chairs. Q4. What kind of warranty is included in the price? Or do you have to spend extra for warranty? A 3 year standard warranty is what’s included in the $4,499 base price. Mind you this is true only for massage chair deals. Not sure what it is if you buy elsewhere. Extended warranties are also available should you wish to purchase. Q5. Can I get a discount? Sure, all you had to do is ask! Ask and you shall receive. Enter in “MAM5” during checkout for an extra 5% off. Consider this a reward for reading this far and continuously supporting my work! FYI: this code is only valid for chairs on massage chair deals! Q6. Are you an affiliate? Will you receive a commission if I buy? Yes and yes. If you choose to buy from massage chair deals using my affiliate link, I will receive a small commission. 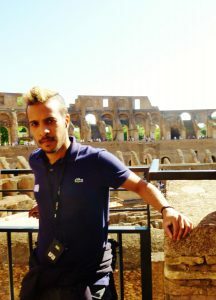 If you think I deserve it, definitely feel free to use my link! Q7. What’s the difference between the IT 8500 and the IT 8500 X3 chairs? IT 8500 X3 features 3D rollers; IT 8500 has 2D rollers. IT 8500 X3 features calf rollers; IT 8500 only has calf airbags. IT 8500 X3 is both Bluetooth friendly and can be controlled using a smartphone app; IT 8500 isn’t capable of either. IT 8500 X3 is more expensive than IT 8500. Q8. Should I buy this chair? Is it worth the money? Check out my final recommendation below. I answer this question in great detail! It’s capable of massaging at a deep tissue intensity. It has fantastic user flexibility. It has an awesome extend and stretch mode. Something very few chairs are capable of! It has a well designed foot massage with plenty of rollers and airbags. Am I okay spending $4.5K for it!? Because in all honesty I would not be okay spending almost $5K for this chair. With this much money I can buy a chair with 3D or 4D rollers, a much larger tracking range, and more auto programs. That being said, if you’re willing to spend $4.5K, you have a plethora of options! I’ve listed some of my favorites below. Osaki 4D JP Pro—100% engineered, manufactured, and assembled in Japan. One of the most underrated chairs on the market! Titan Pro Executive—If you want “bang for your buck”, this is the chair you should be looking at! 3D rollers, 61 airbags, and memory save are just some of the things that make this one of my all time favorites! I’ve previously reviewed all 3 chairs discussed above. You can check them out on massage chair deals by clicking the links below. Check Out 4D JP Pro! Final Recommendation: You may want to consider other options! Finally, I hope you enjoyed reading and got some value out of this post. If you did, please consider sharing on the socials!